The oval face shape has officially been recognized as the one closest to our modern standards of perfection when it comes to beauty. Therefore, if you are the proud owner of such facial features, you should celebrate. However, you also need to find a hairstyle that not only matches your features but also highlights them. 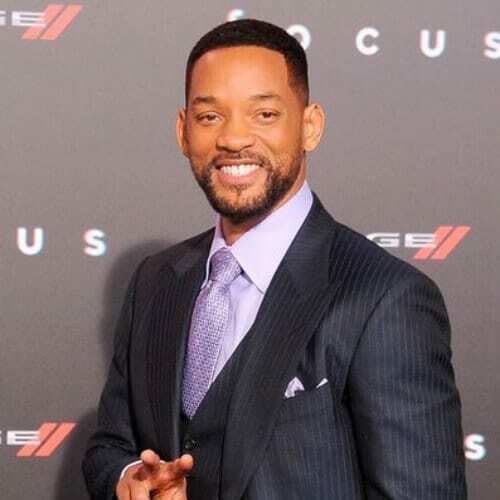 We’ve decided to come to your aid and put together a list of 45 mens hairstyles for oval faces that also includes your favorite celebrities. 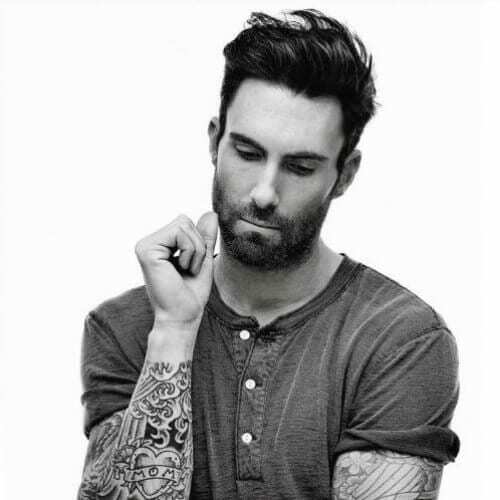 Maroon 5’s Adam Levine has always been one of the most handsome men in the musical industry, and now we know why. The singer has a perfect oval face which he compliments with a boyish, shaggy haircut and a beard. As an athlete, soccer player Cristiano Ronaldo has come as close to perfection as it is humanly possible. Luckily for his fans the world over, his physique is just as strong. 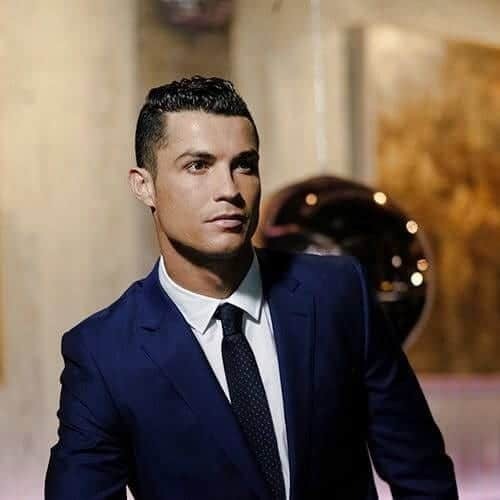 CR7 has a beautiful, masculine face with an oval shape and a pronounced jawline. It’s difficult to create a list of mens hairstyles for oval faces and not include Jude Law in it. Not only because he has such beautiful traits but because his receding hairline is now very famous. The actor is notorious for refusing to shave it off. 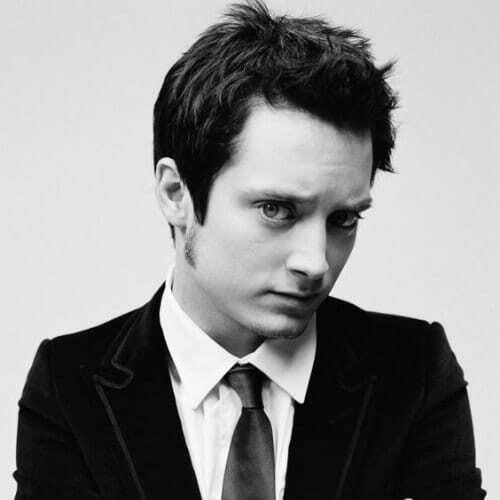 Even though he was not an elf in the saga of The Lord of the Rings, Elijah Wood still comes very close to beauty perfection. 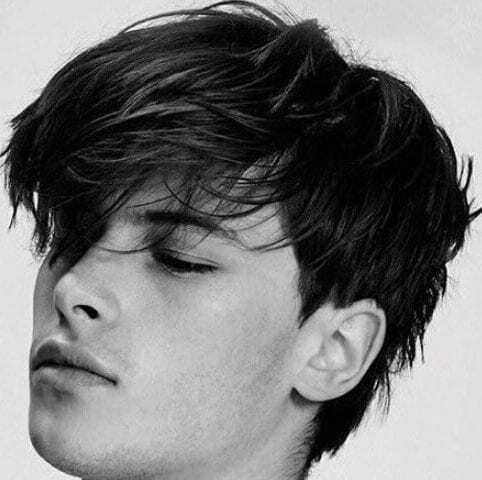 He has an oval face and, as far as mens hairstyles for oval faces are concerned, he wears his hair in a messy short crop. Is it any surprise to anyone that Australian actor Chris Hemsworth has made it onto our list of mens hairstyles for oval faces? Not only is he one of the most handsome actors ever to grace the silver screen but his blonde hairstyle is also now iconic. It’s raining heartthrobs, and this time it’s a Latino one. 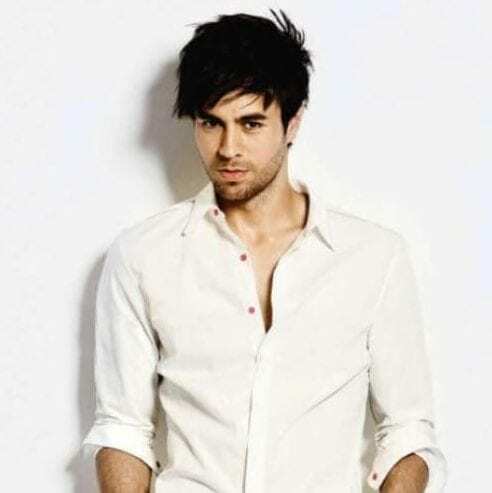 Enrique Iglesias has millions of adoring fans all over the world, and it’s not hard to see why. They copy his shaggy style as well, which is very good, considering Enrique knows a thing or two about fashion. Zac Efron is one of those lovely cases in which we got to watch the actor grow from a sweet teenager on the Disney Channel into the veritable gentleman and heartbreaker that he is today. His chestnut chair and blue eyes surely helped. Speaking about blue eyes, let’s move on to a pair across the pond now. Hugh Laurie is one of the many British gents that we would love to import based on his looks, talent, comedic chops, and accent. There’s no mistake that the One Direction boys are now completely grown up, and that puberty did a whole number on them. 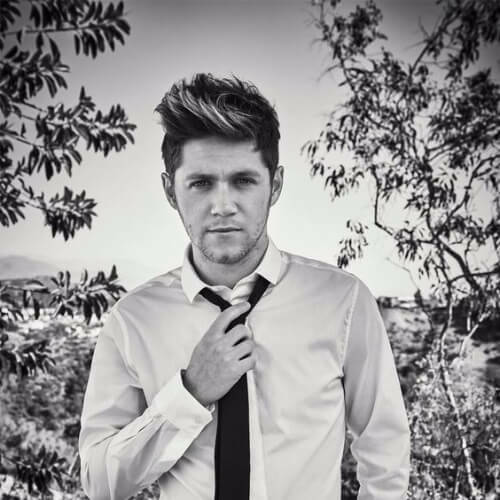 Niall Horan rocked this photo shoot for Flamingos Notion Magazine with a short crop, a shaggy quiff, and just a touch of his old, blonde, Directioner hair. 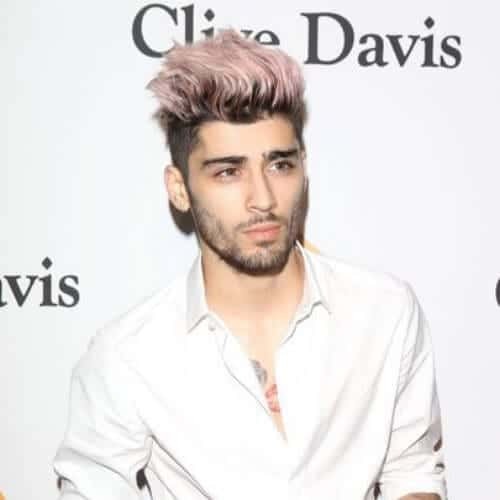 The One Direction trip down the memory lane doesn’t end here because we also need to talk about Zayn Malik’s mens hairstyles for oval faces. As we pointed out above, adulthood has treated the formerly sweet boys very well and turned them into certified handsome men with an attitude. Perfection can also be observed and studied in the shape of actor Ryan Gosling and his mens hairstyles for oval faces. 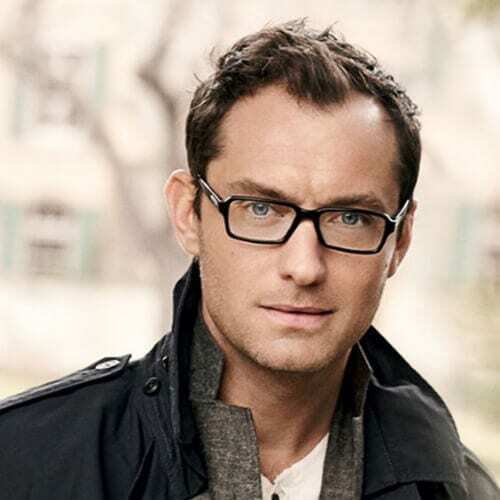 He typically wears a retro, Old Hollywood type of haircut with a side part and gelled locks. If we were to ask the real question here it would be – who is the better Chris, of course? Chris Pine, Hemsworth, Evans or Pratt? But we’ll let you decide. We’ll simply ask which one of them has the best mens hairstyles for oval faces? 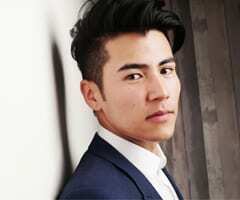 From Thor to Star Trek to Batman, this list of mens hairstyles for oval faces is looking better and better as we progress. 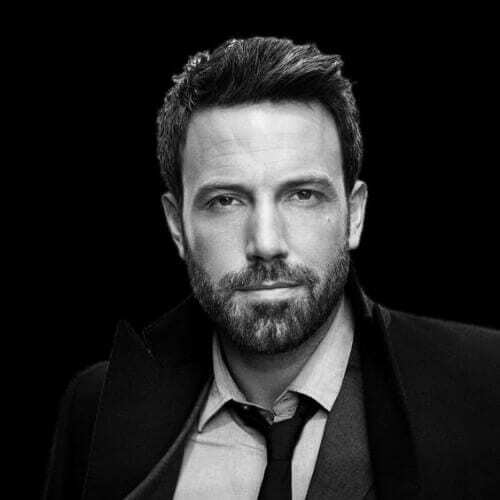 Ben Affleck is definitely an inspiration with his well-trimmed beard and good-guy haircut because if Batman is not your inspiration, then who is? It’s possible we may have spoken too soon on that one. 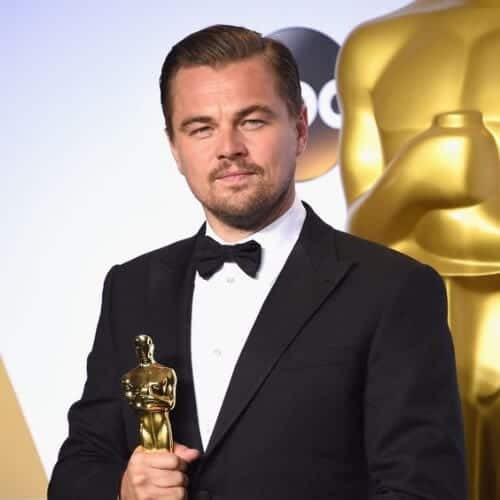 Leonardo DiCaprio is a serious contender as one of the most handsome men in the history of cinema. When he was younger, he used to wear a 90s haircut which you can remember from Titanic or Romeo + Juliet. Today, however, he always wears a vintage comb over. Here is a layered haircut that is bound to flatter any oval face. 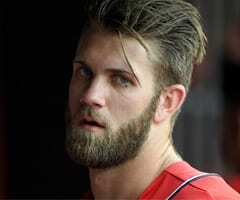 It has a bit of length and volume on the top while the sides are cut short. 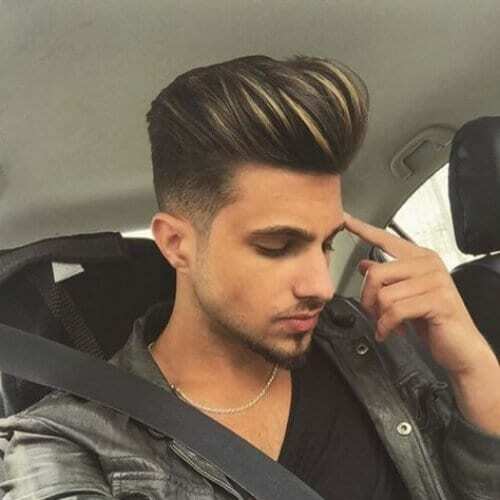 As far as mens hairstyles for oval faces go, this is definitely one of the best ideas. Here’s the second Batman on our list of mens hairstyles for oval faces. 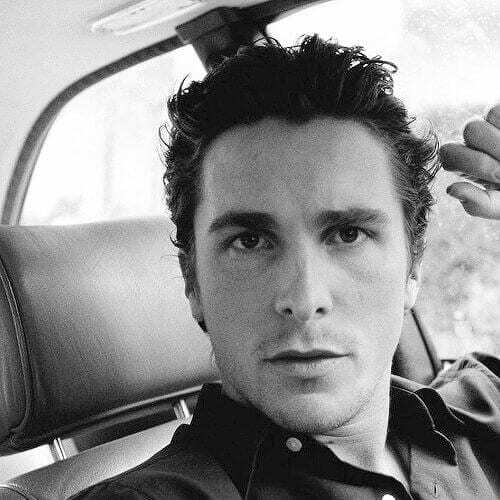 Unlike Ben Affleck who preferred a good guy haircut, Christian Bale opted for a messy, gelled look. Now it’s up to you to decide which one you like more. Sometimes, when you have a face as handsome as this one and when you can boost your perfect facial features, there’s really no need to gild the lily. In other words, let your handsomeness do the talking and settle for a low-key haircut. 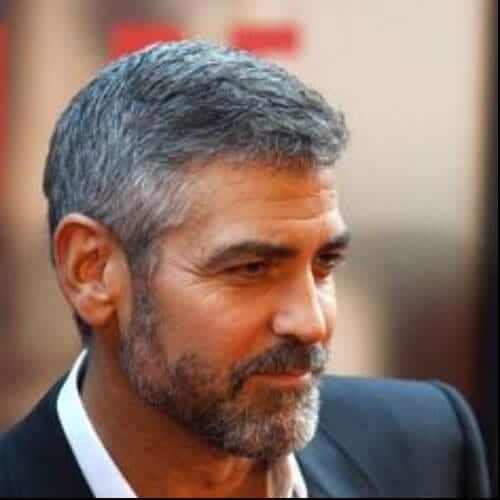 Actor George Clooney has been topping the charts of male beauty for decades now. Yes, the word is ‘decades.’ His secret has to do with his gorgeous symmetrical face as well as his well-chosen mens hairstyles for oval faces. When it comes to mens hairstyles for oval faces, David Beckham can proudly say that he has probably tried them all and then some. From cornrows to mohawks to man buns before man buns were even a thing, this man has truly done it all. 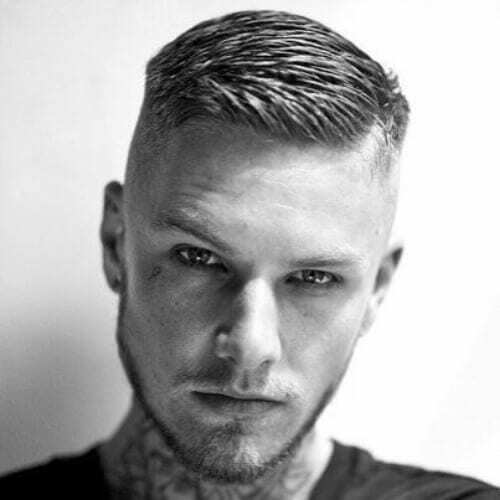 It’s easy to pull off mens hairstyles for oval faces when you are as handsome as Tom Hardy and you have a bad boy attitude and killer confidence to match. That’s when you know that any hairstyle you try, it will fit like a glove. Johnny was a true male style, fashion, and beauty icon of the 90s. Just like Leonardo DiCaprio, he too had the quintessential medium haircut, only his was brunette. 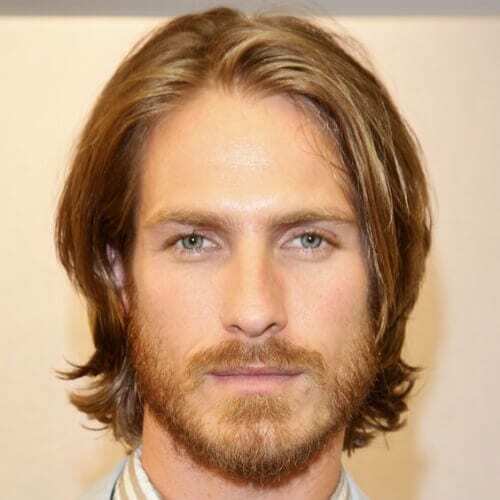 However, if you want to try it, you should know it’s fantastic when it comes to mens hairstyles for oval faces. 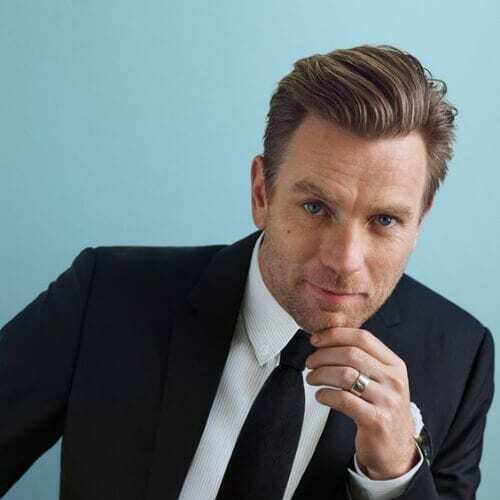 The gentleman look suits actor Ewan McGregor very well, and we cannot help but fall in love with this amazing textured comb over. It’s a hairstyle that will leave your face completely free, highlighting your cheekbones and your chin. The world fell in love with him as the lovable goof who never did much work on The Office. But John Krasinski has matured a lot since his days as Jim Halpert. 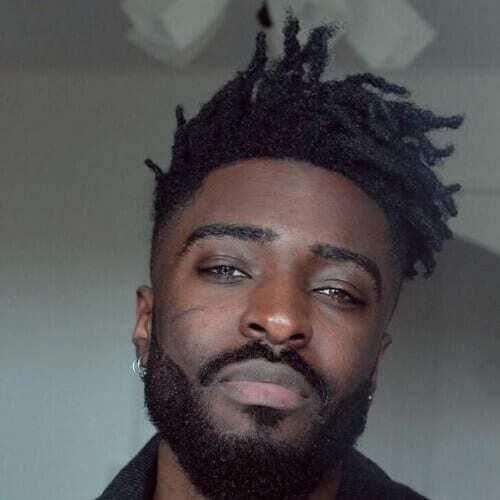 He is now without a doubt one of the most handsome men around with a beauty of a beard and mens hairstyles for oval faces to match. The first Spiderman of the decade was actor Tobey Maguire who portrayed the superhero but never made it to the Avengers panel. 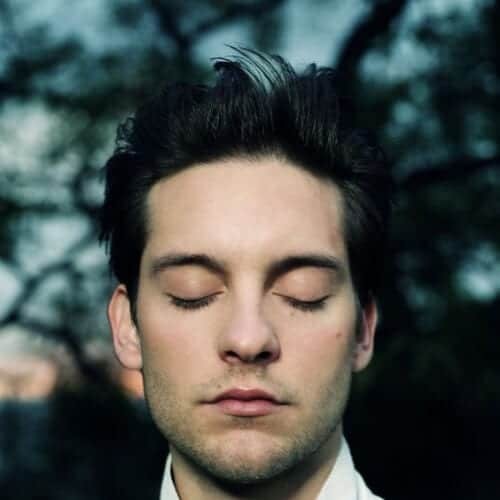 In real life, Tobey wears his hair in a simple, yet ruffled up hairstyle that flatters his face. We’ve already seen Cristiano Ronaldo so now it’s time to take a look his big contender for the title of the best soccer player in the world, Lionel Messi. 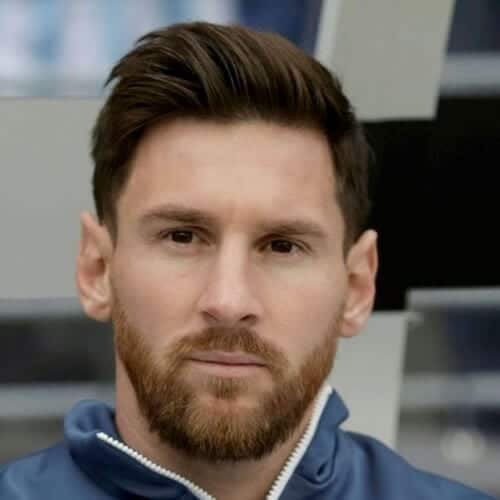 With a lovely ginger beard and a slick back to match, Messi surely is a candidate for the title of cutest player. Actor James Franco has curly hair in real life, so he uses a wealth of hair care products to try and keep his mane in place. He also likes to wear a goatee which accentuates his chin, one of your best features when you have an oval face. 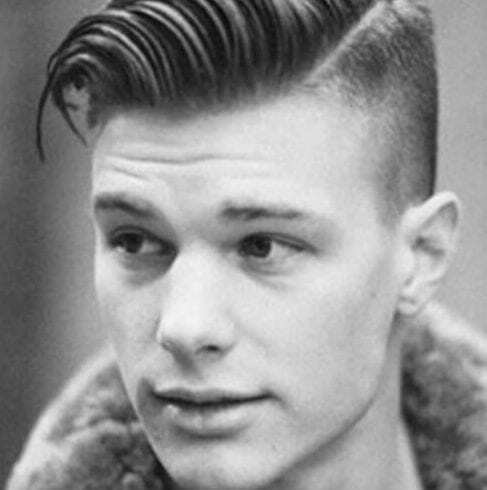 This spiked up contemporary version of the 2000s boyish haircut is absolutely adorable. 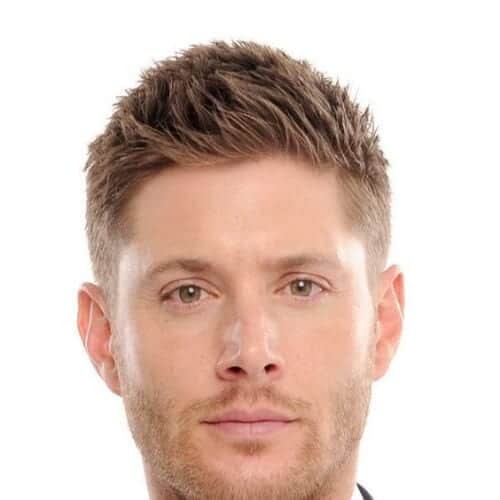 It’s even lovelier when worn by actor Jensen Ackles, so you can have a go at it as well. 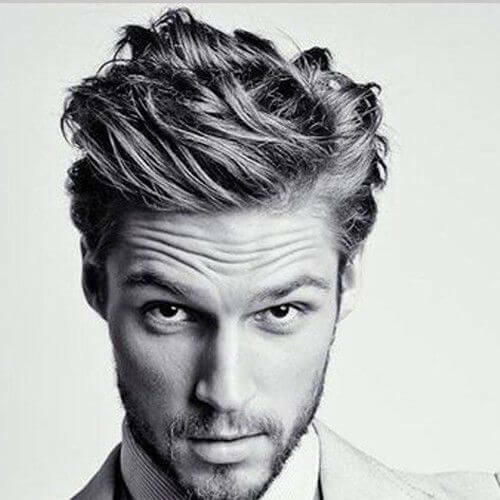 You can’t go wrong with these mens hairstyles for oval faces. 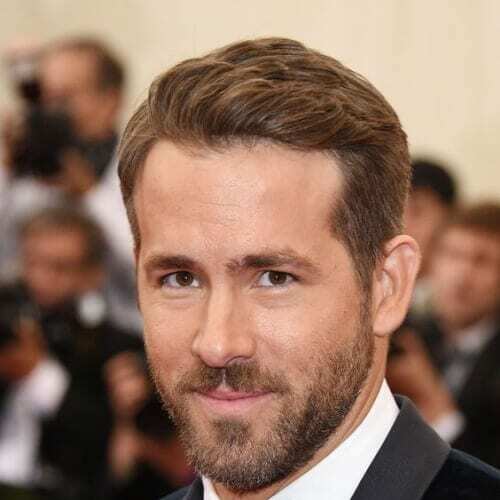 If you have a special event to attend such as a party, your prom or even your wedding, you can draw some inspiration from the mens hairstyles for oval faces that actor Ryan Reynolds usually wears. Jake wears a short crop with a few boyish spikes in the front which you can replicate at home using a little blob of hair wax. His rich and smooth brown chestnut hair color and bushy eyebrows highlight his gray-blue eyes. 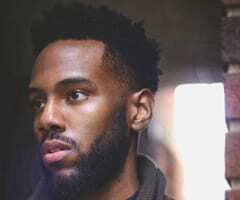 Now an actor in his own right, Michael Jordan’s son is a young and handsome man with a hairstyle to match. We also love the fact that he pairs it up with a simple goatee and two diamond studded earrings for some extra jazz to his look. Many years have elapsed since Justin used to wear his now notorious and equally iconic blonde ‘ramen noodle’ hair. He has matured a lot since then and is now more prone to wearing mens hairstyles for oval faces. 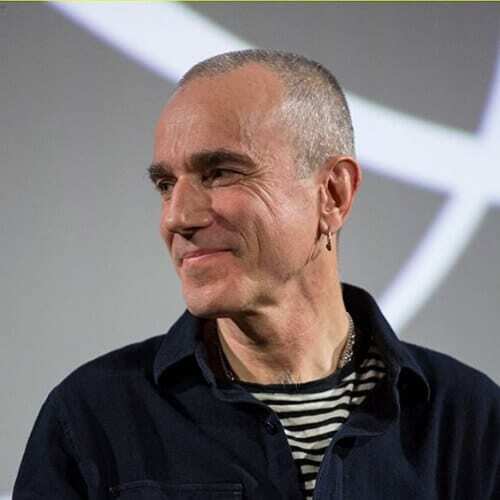 Roughly considered to be the best actor ever save for Marlon Brando, Daniel Day-Lewis has the looks for it as well. Apart from amazing skills the actor has one of the most handsome faces in the industry as well. Too bad he is now retired. 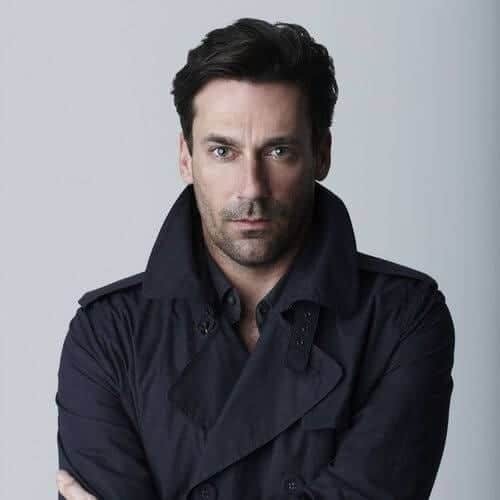 Let’s show some love for our favorite ginger ever and the most famous redhead in the history of literature and cinema. 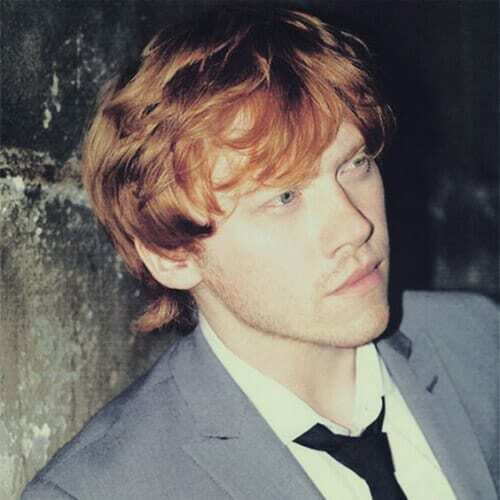 Rupert Grint’s pretty features are showcased by the mens hairstyles for oval faces he wears. If you have an oval face and wish to elongate it even further, you can try this nifty little trick. 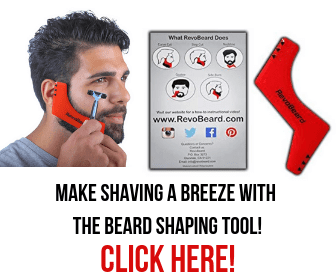 Go for a taper fade or a bald shave. The faded sides of the head will make it appear slimmer and, thusly, longer. 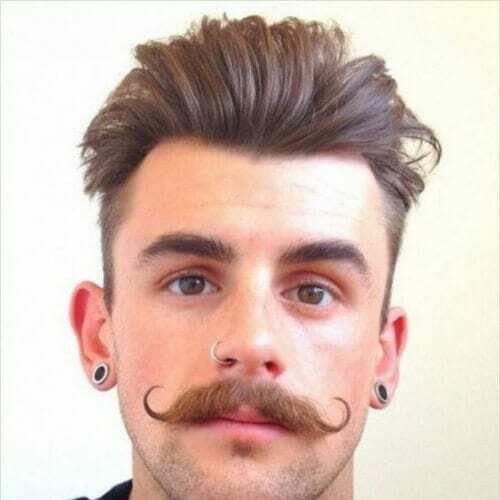 What would a hipster hairstyle be without the handlebar mustache? 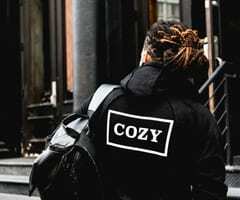 It has now become a staple of the hipster subculture as much as the nose ring, plaid shirts, artisanal beer, bicycles, hair pomade, beard oil, homemade soap, and many more items. 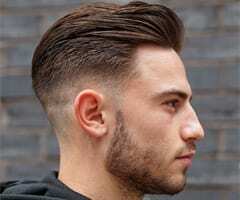 This is a haircut preferred by many men because it requires very little maintenance. It’s a short to medium cut that only needs a bit of moisturizer to keep it happy and healthy. As per the rest, you can simply ruffle it and be on your way. All you need to add texture to your hair is some wax and, possibly, a bit of hairspray to keep it all in place when you’re done. The hairstyle can be as layered as you want, depending on the time of day or the occasion you are attending. Dreads are a fun way of updating your look. Depending on your personal preferences, you can try some traditional long ones, or you can go for a more contemporary look and try the short version which has been very celebrated on Instagram lately. If you want to highlight the tan or the olive undertones in your skin, you can always go for a bit of blonde balayage or for some peekaboo highlights. 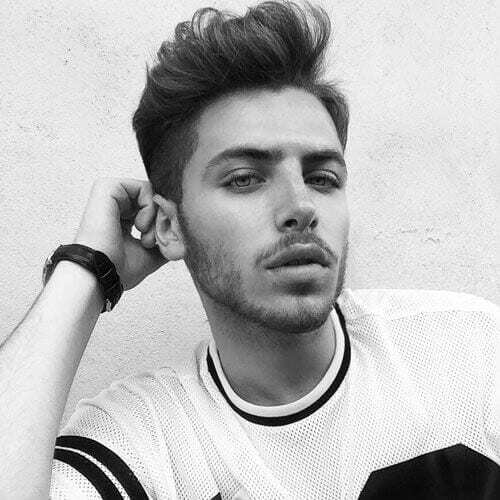 To show them off, put your hair up in a high quiff using a touch of pomade. Oval faces work really well with medium length hair as well. Although, we do have to warn you that a medium length will shorten the face’s verticality. Therefore, if you need that, this is the trick you must learn. Another famous face that has driven millions of teenagers across the world to fall hopelessly in love with him is Justin Bieber. He has soft and almost androgynous features that are complemented by the blonde hair color. If you can’t be bothered to do up your hair too much in the morning, then you can always opt for the ‘I woke up like this’ style. Treat your hair well with high-quality hair care products that will leave it smooth and silky. This hairstyle with lengthen your face and smudge out the external corners of your jawline. Thus, it will make your face look longer and slimmer than it actually it. Plus, it will create the illusion of a perfect oval shape. Here’s a throwback picture of Joe Jonas back when he was in his boyhood band, the Jonas Brothers. He was a sweet teenager with soft, natural, brunette hair which he used to wear all spiked up. If you feel that you are very familiar with this hairstyle that’s because you are. It’s been a huge hit in the past seasons. Therefore, everyone seems to be wearing. This means there’s a good chance you can see it every time you walk down the street. 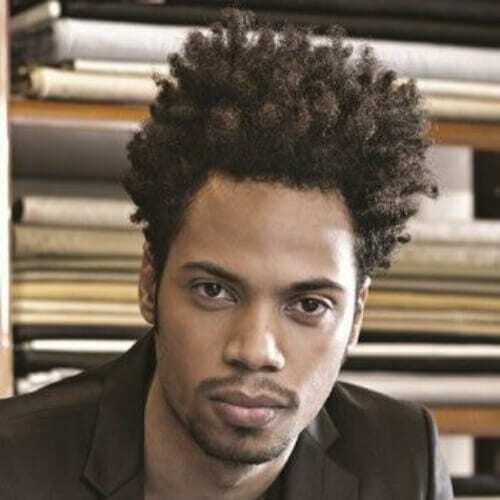 Mens hairstyles for oval faces range from medium length haircuts to dreads to comb overs, slick backs, 2000s spikes or simple curly dos. It all depends on the results you are hoping to achieve and on how you wish your haircut to help your oval face shine even brighter than it already does. Discuss with your stylist the possibilities you have based on the ideas we’ve provided for you!